The XRP / USD price movement has been characterized over the past two days through low price variations and a small number of traded volumes. The price is trying to find a balance after that 100% increase, followed by a strong correction. The price has repeatedly tested the support line S1 (0.19usd). Last night, Ripple announced on Twitter, a meeting hosted by the Shanghai Finance Institute (SFI) participated Ripple, China’s central bank, Circle, Sofi, Prosper and other personalities of the financial world In China. The XRP price picked up very fast from $0.19 to $0.246. The price broke the resistance line R1-0.23usd after which it was easily corrected until. This movement is called in the technical analysis, the false break up. To be able to go up to R2- 0.30usd, the price should break the resistance line R1-0.23usd upwards, and then it must be confirmed as a support. What can we expect in the next two days? 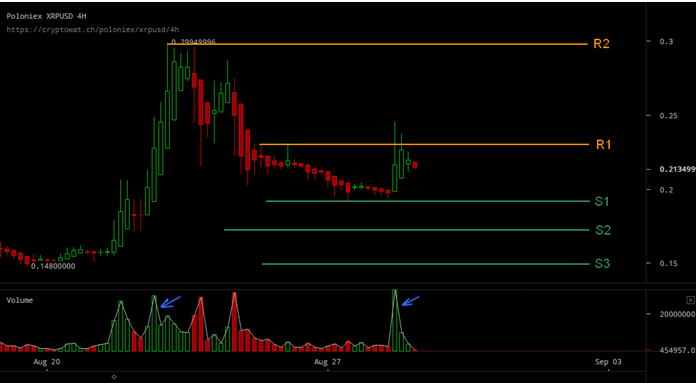 Probable direction for the next two days: lateral movement in the range of 0.19-0.23usd. If there are important volumes traded or a new news appears, we will witness impulsive movements that can break up the resistance line R1 (0.23usd) or down the support line S1 (0.19usd). By the end of the year, news is about the adoption of Ripple technology by banks that are already in the Ripple technology testing phase, as well as the blocking of Escow’s 55 billion coins out of a total of 100 billion. The blocking of 55 billion coins will create a limited offer of XRP on the market, which implicitly leads to a price increase. The block is expected to be announced by the end of the year. Considering the above, XRP / USD may be the best investment opportunity by the end of the year. For those who want to invest, the support line S1 (0,19usd) is a good buying area. The basic rule to guide you is: buy cheap and sell high. I recommend you own XRP by the end of this year. My sales target is 0.75 -0,90 usd. If the price does not reach the price targets in december, but you have a consistent gain it is good to sell. The best solution would be to buy and hold XRP for 1-5 years. The price could fluctuate between $0.90 usd and $1.50 in 2018. You do not ask me how much the XRP will be over 5 years, for that is impossible to predict. Please watch traded volumes. Notice on the bottom of the graph (blue arrows) that the price growth areas coincide with an increase in volumes. Volumes are an important indicator of large buyers entering the market.